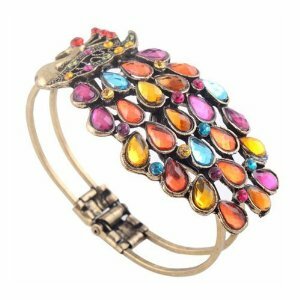 SODIAL- Multi Vintage Colorful Crystal Peacock Bracelet Bangle – $1.25 Shipped!! Today you can grab a beautiful SODIAL- Multi Vintage Colorful Crystal Peacock Bracelet Bangle for $1.25 Shipped!! I have ordered from here before and LOVE everything I have ordered!!! Such a low price, although it can take 2-4 weeks to get your bracelet so order now!